I started noticing the solar panels four or five years ago. My neighbors’ barns starting sprouting them, neat black rectangles covering the south-facing roofs. Down by the ski area, already known for being (mostly) powered by a ridge filled with windmills, an unused stretch of meadow was suddenly filled with rows of waist-high panels, mounted on aluminum frames, turned up to catch the sunlight. A brownfield in downtown Pittsfield, the unused greenspace near exits on the Mass Pike, hillsides behind high schools. The panels were growing like mushrooms after a long spring rain. I started to feel left out. Our house is blessed with a large, south-facing roof that’s visible for miles around, and I started feeling like our asphalt shingles were making a statement: these people aren’t on board with green energy. And so I braced myself to hear about the massive costs of being socially responsible would be. I called Real Goods Solar, who’d put panels on a friend’s roof, and was pleasantly surprised to be quoted a much smaller figure than expected. I was more pleased, if a little skeptical, about another figure Real Goods quoted me – an estimate that I’d recover the costs of my investment in under five years. Despite our northern latitude and eight months of winter, Massachusetts is a very good place for homeowners to put up solar panels, due to a federal tax break and a pair of state subsidies that offer credits for generating solar power. And so I borrowed some money, signed a bunch of papers and began the process of waiting… for the building inspector to approve the engineering plans, for the local utility company to approve the interconnection of my new “generation facility” to the grid. The installation itself took less than two days. And despite a typically grey – if unusually warm – winter, I’m starting to see our house producing significant energy. If projections are correct, I should be a net power producer for a few months this summer, sending more energy into the grid that our house consumes. Since I study social change, I started thinking about what had made it possible for my family to change from consumers to producers of electricity. I’ve been giving a series of lectures that look at the possibility of “effective civics”, taking civic action in the ways that you feel most empowered and effective doing so. I suggest that effective civics sometimes means working to elect a candidate you’re passionate about or lobbying for passage of legislation, but that it often breaks the boundaries of traditional civics and involves nontraditional civic change. To explain what that sort of change looks like, I often turn to Larry Lessig’s book Code and Other Laws of Cyberspace, where he explains that there are four ways societies regulate behavior. We pass and enforce laws, making some behaviors illegal and sanctioning lawbreakers. We use markets to make undesirable behaviors expensive (think of the rising price of cigarettes) and desirable ones cheap. We have social norms which we enforce through praising, shaming and shunning that discourage certain behaviors (explicit racism, sexual harassment) and reward others. Lessig argues that code – both computer code and other technical and physical architectures – regulate behavior as well. Think of the governor that keeps a city bus from exceeding a certain speed, or the code that forces your computer to play a DVD (instead of making a copy of it) when you load it into your computer. These regulatory forces can also be used as levers of social change. While law is a powerful force for social change – the full force of government serves to enforce legal changes – it’s not the only one. Changing attitudes can be as important as changing laws – while it’s critical that LGBTI people can get married, it’s also critical that our norms change so that people aren’t jerks to LGBTI people. Sometimes these alternate levers of change can serve as a shortcut or another option when paths to legal change are blocked. Edward Snowden’s revelations about NSA surveillance have not led to significant legal change within the US, but citizens frustrated at being surveilled can take steps like using Tor and Signal/Redphone from Open Whisper Systems to make their communications harder to monitor, leveraging a code-based theory of change. And those frustrated by slow progress curbing CO2 emissions can buy an electric car, or put up rooftop solar panels, using markets to signal preferences and take action. I’ve run half a dozen workshops encouraging activists to think about effective forms of social change in terms of these four levers. Each time, someone has raised the key idea that successful activism usually uses a combination of these approaches, if not all four levers. Turns out that’s true for the adoption of rooftop solar as well. 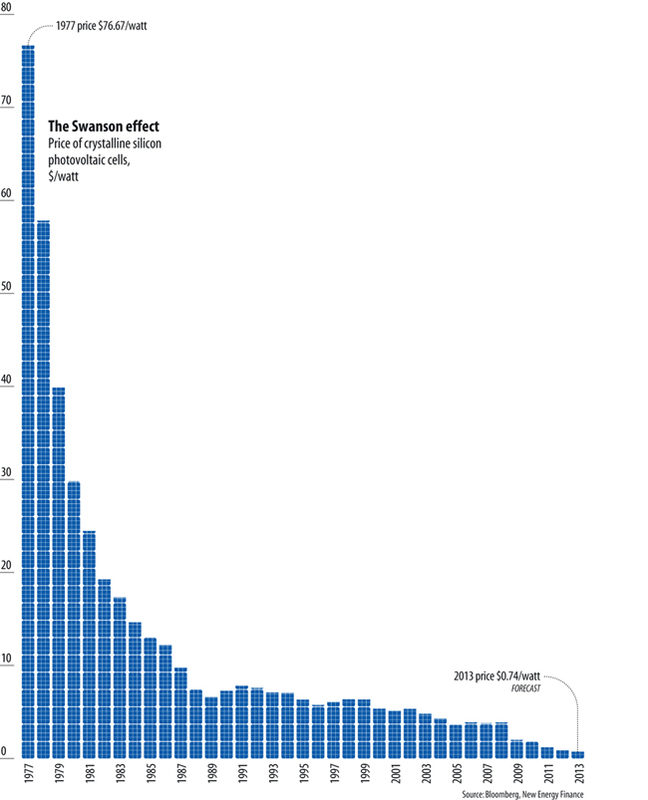 Photovoltaic panels have gotten LOTS better in the last few years, and way, way cheaper. When Jimmy Carter was putting solar panels on the White House in 1979, there’s a reason he chose thermal panels to heat water, not photovoltaics to produce electricity: PV panels cost a small fortune, roughly $40 per watt. Panel prices are now down below $1 per watt, and the least expensive Chinese panels are roughly 50¢ a watt. These cost savings come from increasing the efficiency of panels while reducing their manufacturing costs. Chinese manufacturers, rewarded with state subsidies, began competing to improve their production of panels, making the wafers thinner, and learning new techniques to make polysilicon, which has decreased in price from $400 per kilogram to $15 between 2004 and today. The other major change has been improvements in installation system – panels now click into speedily assembled aluminum frames, which makes a routine rooftop installation about a quarter of the time it was a decade ago. These technology developments – changes in code – mean that installing rooftop solar is an option for vastly more people than it was even a decade ago. Of course, the main thing the technology changes have done is made solar panels cheaper. And that’s not the only market force at work. Installers realized that the upfront cost of rooftop solar was a limiting factor for many homeowners. My system cost about $27,000, a sum I financed by taking out a home equity loan. But that’s not an option for everyone, and a number of creative options have emerged to make solar more accessible. One option is third-party ownership, in which an energy company installs, maintains and owns the panels on your roof. You enter into a long-term contract with the energy company, which sells you energy from the panels on your roof, usually at a cost lower than the local energy company. There’s no money up front, but you don’t end up owning an asset. The popularity of this model appears to be peaking, but it’s widely agreed that it allowed the rooftop solar market in the US to have 50% year on year growth for much of this decade. All the companies involved with solar energy are trying to make a buck. But they’re contributing to social change and fighting climate change in the process, using market mechanisms to make change. While it takes only a few years to recover the costs of a photovoltaic solar system in Massachussets, neighbors ten miles away in Vermont would require 16 years to recover their costs. The laws are different. Until 2015, Vermont had very low renewable energy portfolio standards, which meant they didn’t have SRECs – now they have very high standards, we are likely to see an SREC market soon. Net metering doesn’t work as generously in Vermont as in Massachusetts. These subtle legal differences help explain why friends across the border frequently put in solar hot water systems, but much less often invest in photovoltaics. Other incentives are based on laws at the federal level. The Energy Star credit, which expires this year, gives 30% of a solar system’s cost off your taxes – not your income, your tax payment. That credit is slated to drop to 10% in 2017, unless it’s renewed… and given Congress’s current dysfunction, that seems unlikely. The laws that have made solar so attractive in Massachusetts are expiring – the existing supply of SRECs are spoken for, and unless the program is renewed, the economics of solar energy in the state will be sharply different. Law has been a powerful force prompting adoption of solar in Germany, Spain and parts of the US. Subsidies are now falling, and it’s not clear whether solar will be as attractive in a few years as it is now. But it wasn’t rational economics made possible by laws designed to challenge climate change that got me to put panels on my roof. It was something far more basic. I started this essay by admitting that I put solar panels on my roof out of social pressure. I began worrying that our house – visible from the valley below – was making a statement that we were either insufficiently savvy to have invested in solar energy, or were climate change deniers. My friend Judith Donath explains that fashion is a form of signaling. By wearing the latest fashions – on your body or on your house – you send a variety of signals about who you are, what you value and what you know. As my neighbors and I put solar panels on our roofs, we are signalling a change in social norms. It’s becoming normal to generate your own power, to make an expensive investment designed to have both an economic and environmental payoff. 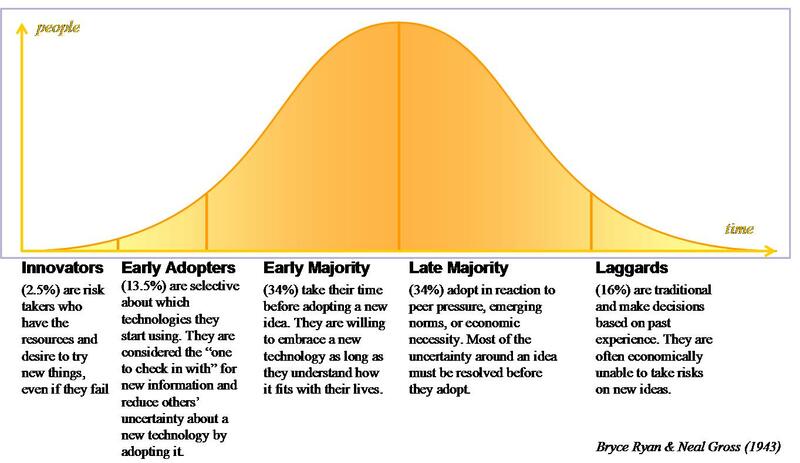 At this point, we’re likely in the early adopter phase of rooftop solar, or perhaps the early majority. If this curve continues, at some point it will be a statement to not have solar panels on the roof, much as it’s a statement to have remained off Facebook or the Internet as a whole. There are reasonable “why nots” to rooftop solar. For one thing, the tiny plant on my roof is less financially efficient than large solar installations deployed by developers. But critics who describe rooftop solar as a “craze” are missing a key point. Solar is taking off because it’s something an individual can do about climate change. Much as buying a Prius won’t end global warming, my solar installation won’t halt climate change. But I can’t get the US to commit to an enforceable and ambitious target to lower carbon emissions as much as I might hope for one, or build a nationwide carbon market. Efficacy matters in civics. More to the point, the perception of efficacy matters. I may not be able to persuade myself that influencing Congress on climate change is a good use of my time, but it’s an excellent use of my time to bring up my support for clean energy and my concerns about losing SRECs to my excellent state senator Ben Downing, who chairs the state senate’s committee on telecommunications, energy and utilities. And I’m able to persuade myself that my solar panels will offset enough emissions that I can feel slightly less bad about buying a diesel Jetta. (My intentions were good, I swear.) It’s rare to feel like you can do something unambiguously good for the world – generating solar power is one of those rare cases, thanks in part to these four levers of social change coming together. I had an excellent experience using Real Goods Solar to install panels on my rooftop. Other than signing a contract and making payments, I did nothing – they took care of all the permitting and interconnection. If you end up using them to install solar at your home and use this link, I will receive credit for referring you. I can imagine the conversation between the Chinese leadership and the engineers who were asking for funding. At this point the leadership fall on the floor laughing.